The Problem: Liquid Natural Gas requires a lot of power for gas compression. At this site 27 GE Frame 5 gas turbines, manufactured by Nuovo Pignone are used for this process. The original equipment exhaust gas sensors on these turbines are not robust enough to survive the long base load run times which causes turbine trips due to sensor failures. Must have a longer performance life. Must have flexibility to be installed with a lube oil drain pipe in the way. Must be easily and quickly replaceable when service is required. The Solution: A new sensors design approach was taken to meet the above challenges. 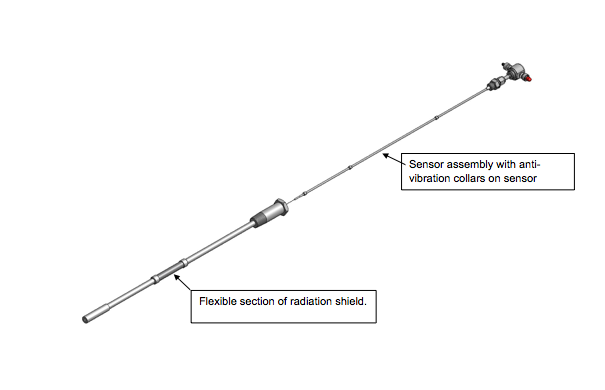 The sensor was designed with a slightly larger tip diameter (2mm) versus the original of 1.6mm. This design change increases the thermocouple element wire diameters by 40%. This added robustness results in increased life. A unique flexible radiation shield was designed, that allows the sensor with the lube oil drain pipe in its path, to be installed without interference. The new sensors were designed with a two piece design. The sensor side has a stud type terminal head with the studs that are different sizes so cable hook up is fool proof. The cable assembly remains in place on the turbine and only the sensor will need replacement when service is called for.